Police in Indiana banned a hip-hop performance that would have been done remotely, via hologram. What? This entry was posted in and tagged asral projection, censorship, Chief Keef, concert, Hammond, hip-hop, Hologram, Indiana, Music, race, racial issues, rap, rap festival, rapper, Science Fiction, tase, taser on July 30, 2015 by Ted Rall. SYNDICATED COLUMN: “1984” Is Here. Yawn. 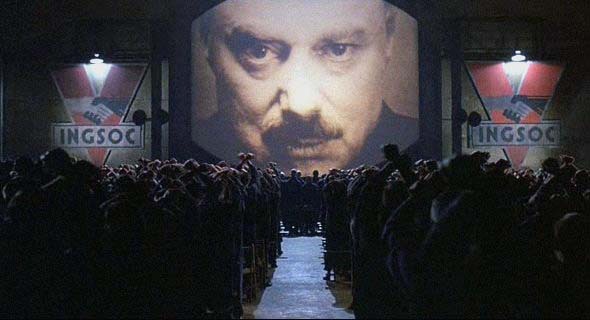 Orwell’s Nightmares Come True — But Who Cares? Another horror no one will care about: the government is spying on your snail mail. Just a wild guess? How about: forever? “Together,” the paper continued, “the two programs show that postal mail is subject to the same kind of scrutiny that the National Security Agency has given to telephone calls and e-mail.” Any government agency — the FBI, local police, etc. — can request mail cover data. As with the rubber-stamp “FISA court,” the USPS almost always says yes to these outrageous mass violations of privacy. “It’s a treasure trove of information,” the Times quotes former FBI agent James Wedick. “Looking at just the outside of letters and other mail, I can see who you bank with, who you communicate with — all kinds of useful information that gives investigators leads that they can then follow up on with a subpoena.” Your finances. Your politics. Your friends. No doubt about it, the dystopian vision laid out by George Orwell in “1984” is here. Thanks to NSA leaker Edward Snowden, we’ve learned about the previously top-secret PRISM program, in which the U.S. government “collects the e-mail, voice, text and video chats” of every American to be stored in a $2 billion data farm in Utah, as well as sweeping telephone surveillance by Verizon and other telecommunications companies on behalf of the NSA. According to NBC News and other sources, “every single phone call made in the U.S. has been monitored by the U.S. government.” And not, merely, as President Obama and his media shills keep saying, “just” (!) the metadata. Under ECHELON, they listen in to “all telephone, fax and data traffic,” record it, and store it. Verizon’s patent was denied. But now Google TV is going for it. The technology exists; it’s only a matter of time before it finds its way into our homes. Anti-privacy tech types point out it’s only to make ads more effective — the same way web ads react to your searching and browsing. But that’s just for now. It isn’t a stretch to imagine the NSA, FBI or other crazy spook outfit tapping into America’s telescreens in order to watch us in our living rooms and bedrooms. Gotta stop the terrorists! Whatever it takes. Governments rule over the governed either by obtaining their tacit consent, or by crushing potential opponents by making them afraid to speak up. Option two is where we are now. One horror follows another. At Guantánamo concentration camp, where les misérables of America’s War of Terror languish for year after year, uncharged with any crime, U.S. government goons announced that they will continue to force-feed more than 100 hunger strikers during Ramadan, a month-long holiday when devout Muslims are required to fast. WikiLeaks founder Julian Assange is trapped in the Ecuadorean embassy in London because he fears extradition to and execution by the U.S.; Ecuador has discovered that some Western intelligence agency planted a bug to watch him. Meanwhile, Edward Snowden has been de facto stripped of his U.S. citizenship, his passport canceled, rendering him effectively stateless. Meanwhile, the megacriminals he exposed — Obama and his cronies — are living large. Assange and Snowden are no longer important. They’ve done all the damage they can do. But the U.S. will never leave them, or any other enemy of the state, alone. It’s about terrifying potential political opponents into submission. This entry was posted in Blog, Columns and tagged 1984, dystopian, Echelon, Ecuador, Edward Snowden, England, FBI, Federal Bureau of Investigation, Fierce Cable, George orwell, Google TV, Great Britain, julian assange, Mail, mail tracking, MICT, National Security Agency, NSA, O, O'Brien, post office, Privacy, Science Fiction, Spying, surveillance, telescreen, U.S. Postal Service, USPS, verizon, WikiLeaks, Wiretapping on July 4, 2013 by Ted Rall. This week: L.A. teachers agree to shortening the school year by 10 days to 175 days, and accept a commensurate pay cut. This is the fourth year in the row that the school year has been shortened. This entry was posted in Blog and tagged blogger, education, furlough, Future, Labor Management Relations, Local Cartoon, los angeles times, school year, schools, Science Fiction, Stupid, teacher unions, Unions, unpaid on June 21, 2012 by Ted Rall.